Summary: Wet. Wet. Wet. With a few strong to severe storms. Word of caution: I do outline quite a bit what may or may not happen at certain times. I’m only basing this off of one model and one model run. Take the advice with a grain of salt. Models change frequently and no one can say with confidence that it will or will not rain at a certain point more than a couple of hours away. Have a backup wet-weather plan. Hug your weather radio. 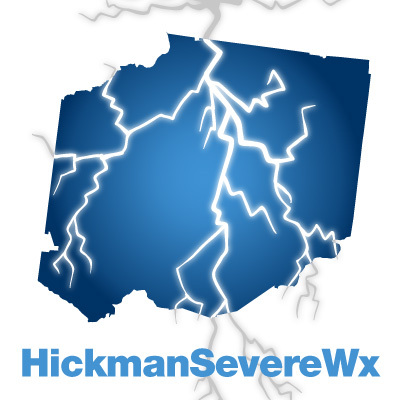 Follow us on Twitter @HickmanSevereWx. Watch your favorite weatherman on TV. I wish I could say your holiday extended weekend will be dry and 75 degrees with plenty of sunshine, but I can’t. Today, we’ve been given a 100% chance of rain and thunderstorms with a high temperature climbing to 80 degrees. Winds will be out of the southwest at 10mph. The Storm Prediction Center has placed us for the third day in a row in the SLIGHT category for severe weather. With this comes a 15% chance of seeing damaging winds 55+mph or greater within 25 miles of a point, and a 5% chance of seeing hail greater than 1 inch in diameter within 25 miles of a point. 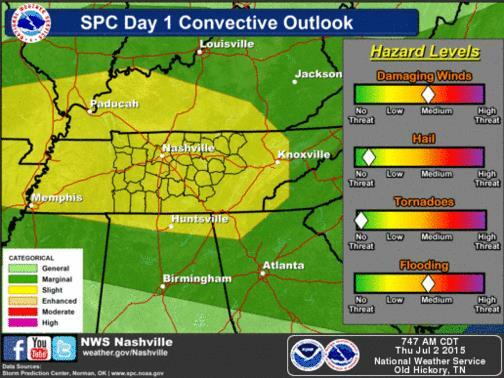 Today’s main concern is the damaging winds and flooding, as shown in the NWSNashville graphic below. NWSNashville even issued a Special Weather Statement about the flooding potential due to all the rain we’ve already received. WITH CAUTION WHERE WATER COVERS THE ROAD. 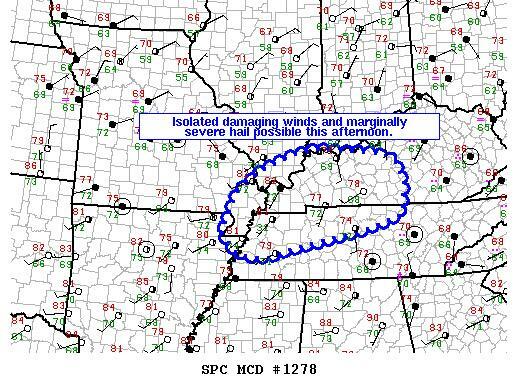 At the time of this writing (12:06pm) the SPC is currently considering a possible SEVERE THUNDERSTORM WATCH that may or may not include Hickman County (we are on the edge of the area they are concerned about). CLUSTERS WITH ISOLATED DAMAGING WINDS AND MARGINALLY SEVERE HAIL. 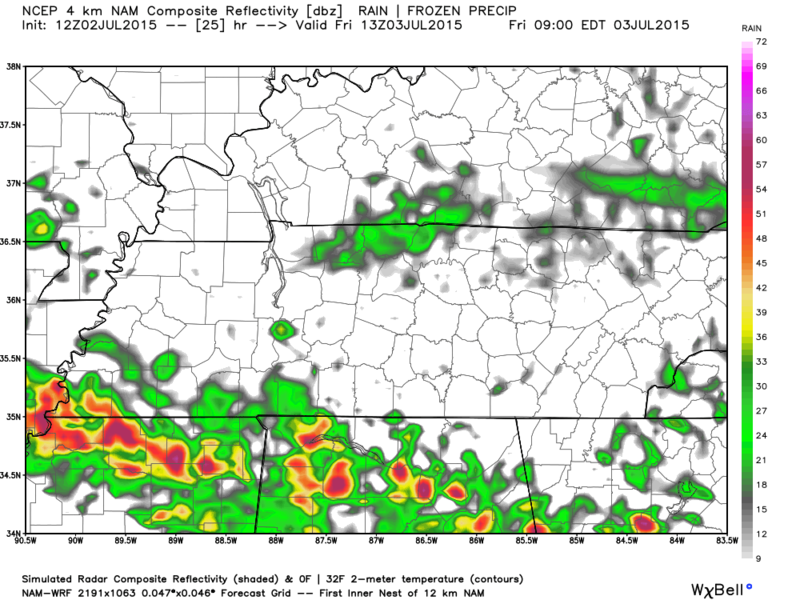 Let’s look at the models, which doesn’t seem to give us a crystal clear picture of the rains. 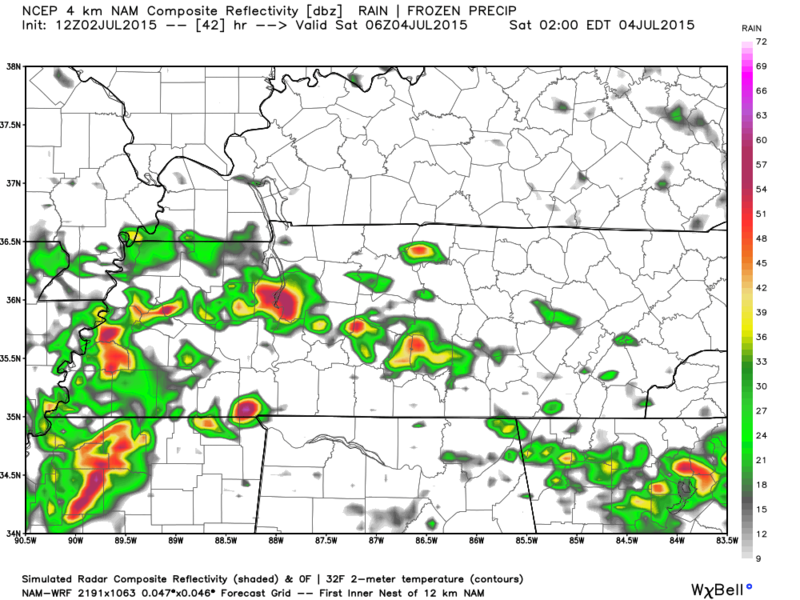 First up, the HRRR (short range rapid refresh). Below is the simulated radar loop starting at 11am Thursday and goes through 1am Friday. The HRRR feels we are going to get a ton of rain later this afternoon, more specifically, around the 1pm to 3pm timeframe. 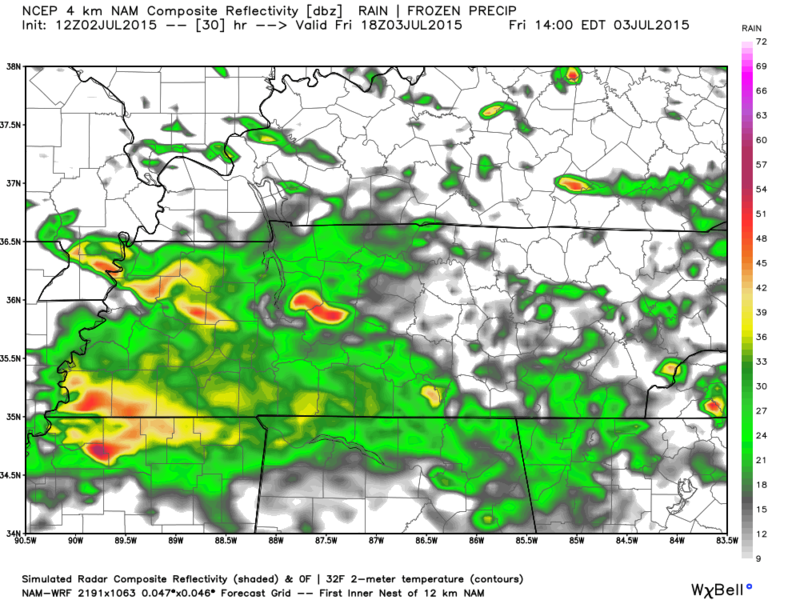 Below is the 1pm look at the simulated radar. Tonight, rain chances drop slightly to 80% while our overnight low drops to 69 degrees. For Friday, rain chances go down slightly to 60% chance of rain with a high temperature of 80 degrees. Currently, the SPC only has us in a MARGINAL category for severe weather, but could change tomorrow depending on how they feel about the storms becoming severe. 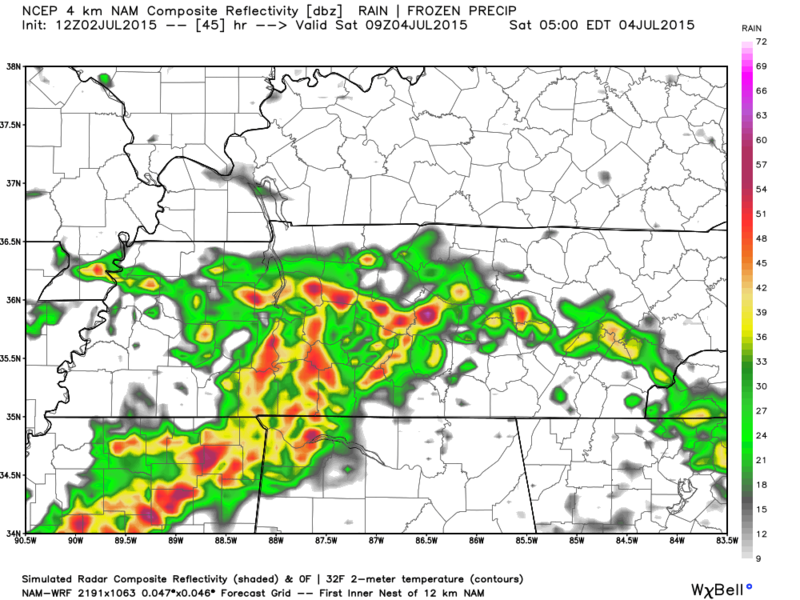 NAM4 shows some strong storms south of us at 8am in the morning. These storms will linger around the Tennessee/Mississippi/Alabama border and give fuel to afternoon showers and storms. 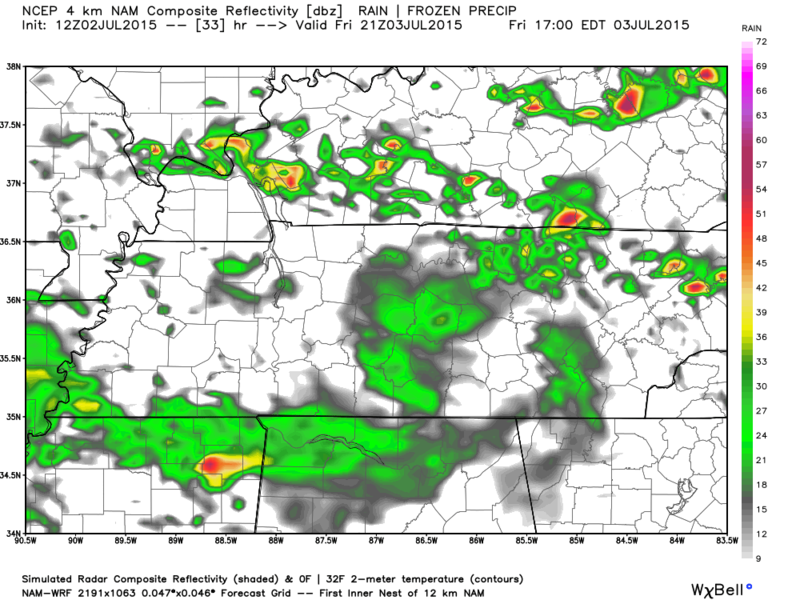 Here’s NAM4’s simulated radar for 1pm Friday. Rain attempts to clear out around 4pm leaving scattered showers. Friday night rain chances decrease to 50% chance with an overnight low of 69 degrees. Winds will be out of the southwest at 5mph. For those of you curious about Fairview’s Fireworks show starting at 9:30pm, the rain may hold out long enough for you to enjoy some music and the fireworks show. 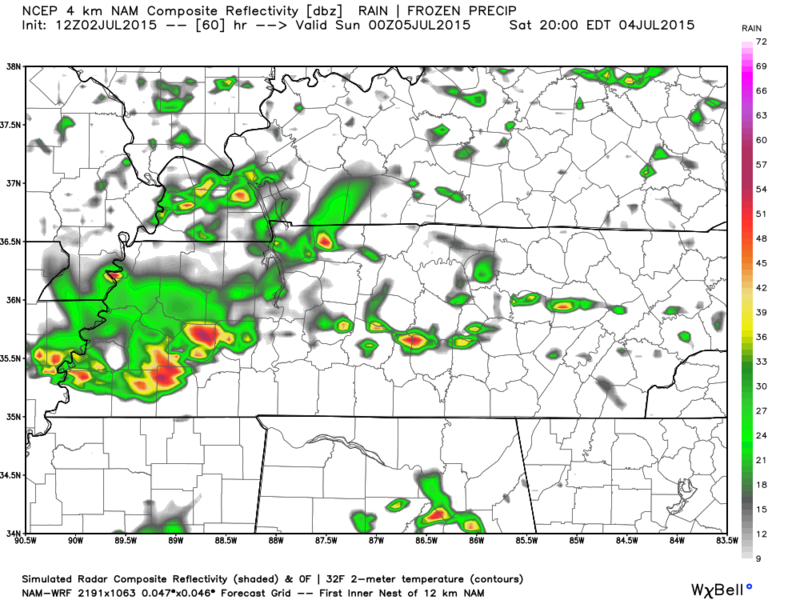 Here’s the NAM4 simulated radar for 7pm. 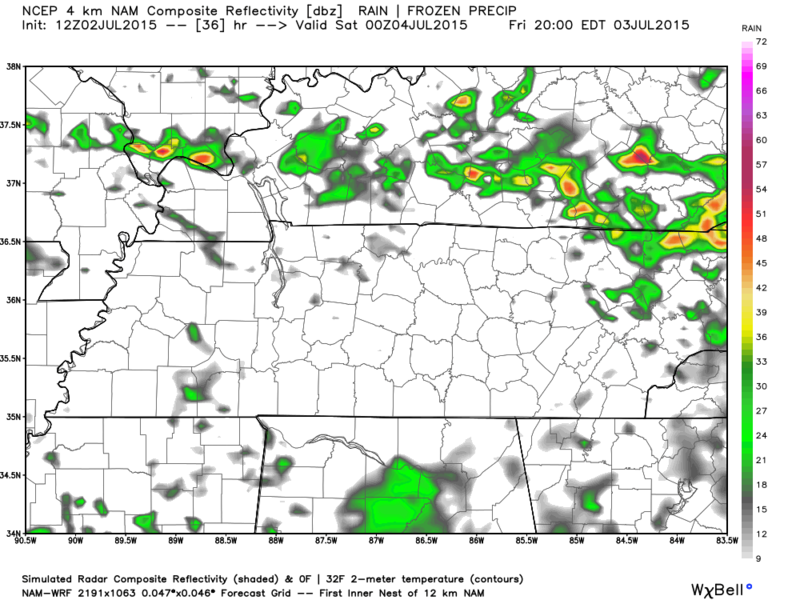 And the NAM4 simulated radar at 10pm. Fireworks should be good in Fairview at the start time, as of right now. Models change frequently but this is what we have for now. Why the three hour jump in time? This model doesn’t do hourly after 36 hours in the future. Overnight Friday into wee morning hours Saturday, more strong storms develop that will give us Nature’s version of a fireworks show with lots of lightning and booms. 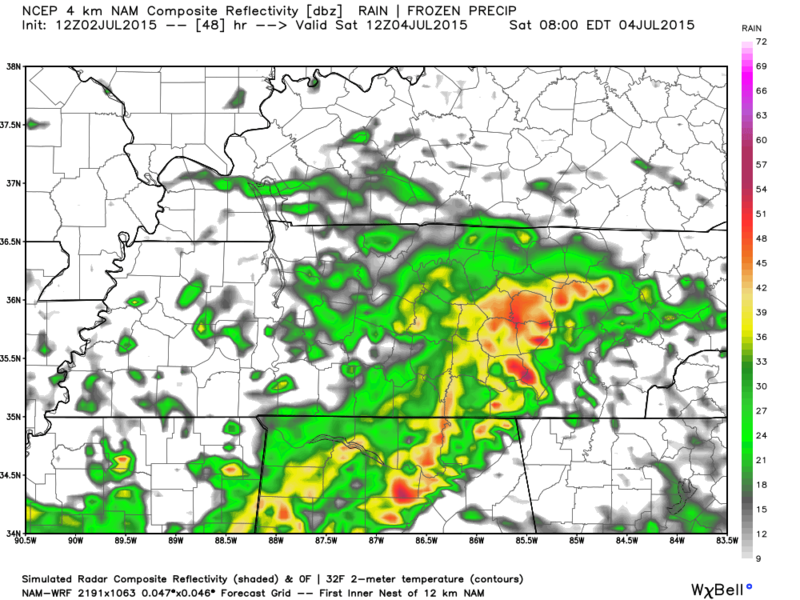 Here’s NAM4’s simulated radar for 1am. And more of Nature’s fireworks will continue through 4am Saturday morning. If these storms are as strong as they show here, we will be up and live-tweeting/nowcasting the severe weather on Twitter @HickmanSevereWx. Make sure you bring your weather radio in the same room with you (if it isn’t already there). For the Fourth of July, we are given a 60% chance of rain and thunderstorms with a high temperature of 79 degrees. By 7am Saturday morning, most of the overnight Nature’s fireworks show (thunderstorms) will be pushed to our east, leaving lingering showers behind. Midday dries up a bit leaving lunch-time grilling in tact for the time being. 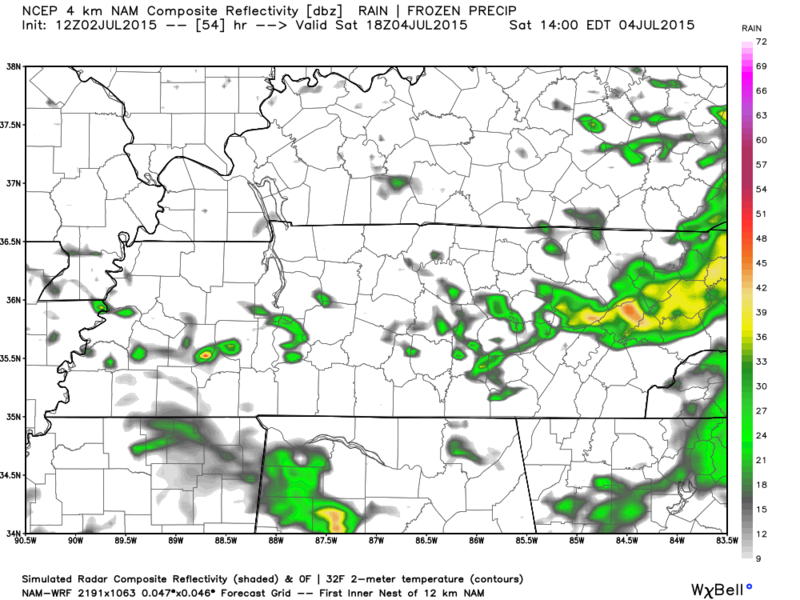 Here’s NAM4’s simulated radar for 1pm Saturday. 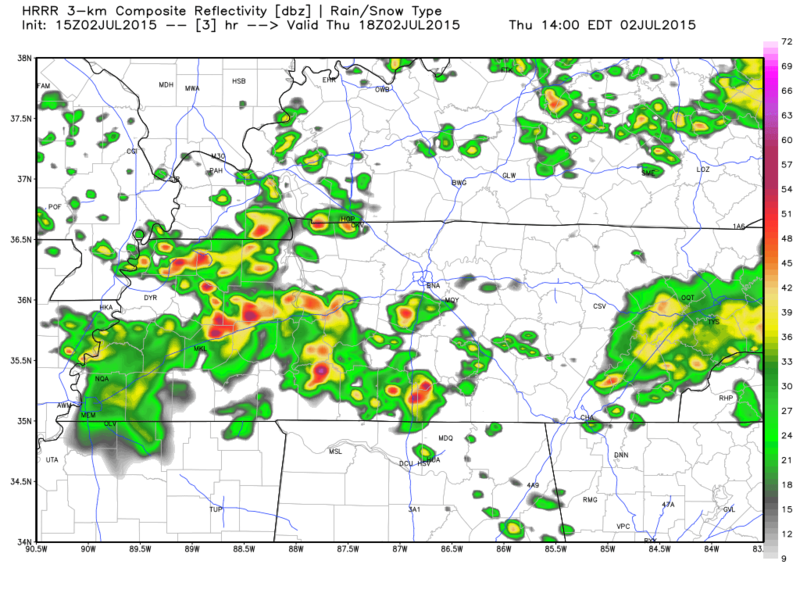 More storms will start popping mid-afternoon. For Saturday night, rain chances decrease slightly to 50% and our overnight low temperature will fall to 69 degrees. 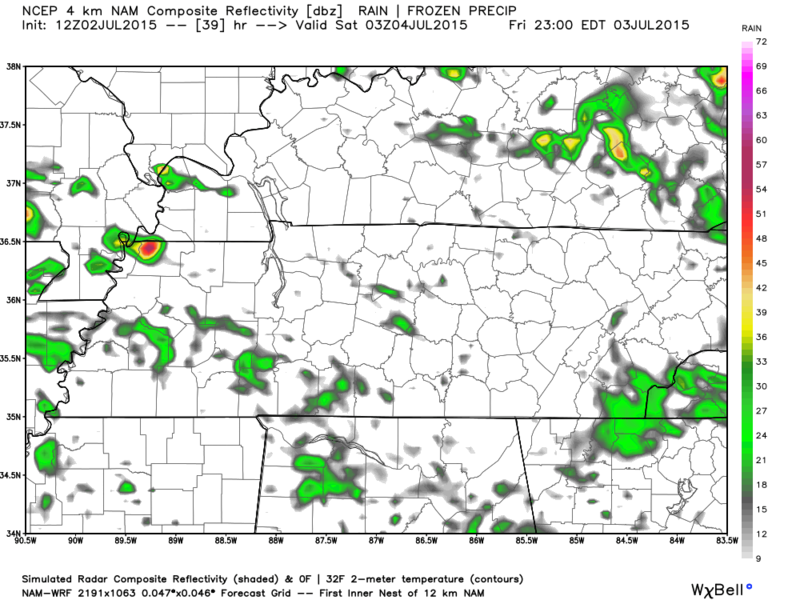 Here’s NAM4’s simulated radar for 7pm Saturday night, which is putting both Centerville’s and Nashville’s fireworks shows in jeopardy. I’ll post more about these fireworks shows as we get closer in time and the models start to fine tune a bit.